Children can be very trusting. They are innocent and they have not yet developed a healthy sense of skepticism about the motives of others. Teaching your children about whom they can trust and whom they should avoid is an important part of safety education.Stranger danger is the easy to remember term used to impart a sense of awareness about strangers. Help keep your child safe by teaching them about stranger danger. Teaching this discernment is a delicate balancing act. You don’t want your child to come away with the impression that everyone is out to get them. This is not only psychologically straining for the child; it can also be dangerous. There are some instances in which seeking the help of a trusted stranger is exactly what is called for. Read more to learn about stranger danger. Stranger danger is a catchy little phrase that sums up the danger posed by strangers to children. When teaching your child about stranger danger, it is essential to make the distinction between “good” and “bad” strangers. Failing to do so could result in your child avoiding the people to whom they should turn to for help in the case of an emergency or dangerous situation. Our childcare center is a safe a secure place to learn! 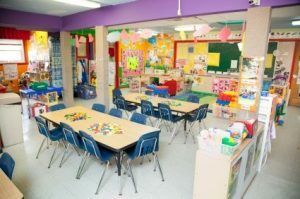 At Toddler Town, we are dedicated to keeping all the children who attend both our Evanston and Chicago locations as safe as possible. Every classroom in our center, the playground and both sides of the building are equipped with an ADT video monitoring system. This is to ensure the safety of the children, parents and staff. Also, everyone must provide a personal 4-digit code in order to enter the building. These security features in combination with a good education about stranger danger will keep your child as safe as they can be. Come take a tour of our facility, check out our security features or contact us today! We look forward to hearing from you!